Bio:Akshay Chopta is the graduate of the prestigious National Defence Academy and the Air Force Academy. 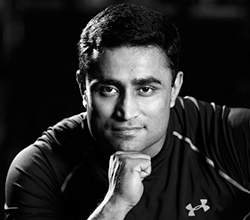 He was commissioned in the Indian Air Force as a pilot and has been the captain of the Air Force Best Physique team. He is among the most qualified fitness professionals in the country with a range of international certifications and courses. Akshay has trained and studied under some of the best coaches in the country like several times national high jump champion Mr Syopad Singh, legendary bodybuilder and Air Force coach Mr. Prasad Kumar and bodybuilding legends like Mr. KLNV Prasad and Mr. Bhakta Kumar, doctor and national powerlifter Dr. Dhananjay More etc.